This stunning Vancouver area bathroom renovation designed and projected managed Allan Wray and Nicole Phillips is featured on our Houzz profile. This bathroom, located in West Vancouver, features Columbia Cabinets V113 vertical grain matched walnut veneer slab doors with a natural finish and Concealed Blum soft close cabinet hinges. The bathroom cabinet hardware are Richelieu BP57680140 chrome edge pulls. The cabinets are topped of with Caesarstone Bianco Drift Countertops, 6131, 3cm, single eased edge. The floors throughout this bathroom are heated with Nu-Heat in-floor radiant heat pads. There is additional heating, including a Kontour Square 24×39 heated towel bar. The shower stall, located in a semi separated alcove includes Julian Tile CEMBI1224R 12×24 porcelain tile on the floor and shower curb and Julian Tile Onix Hex Taupe Blend on the shower floor. 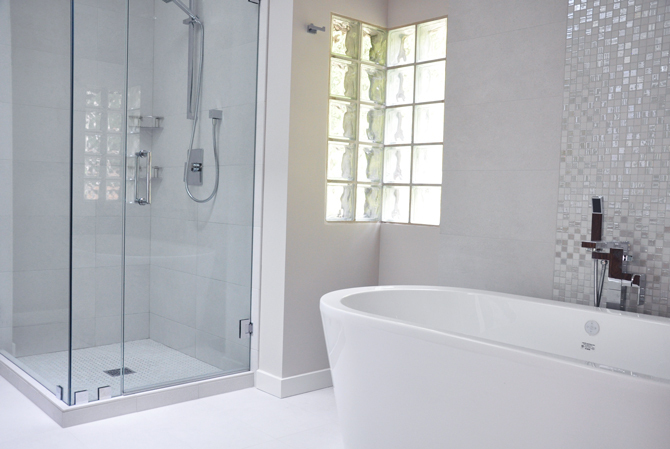 A custom 10mm clear glass shower door and panel, complete with clips and hinges finishes out the shower area. 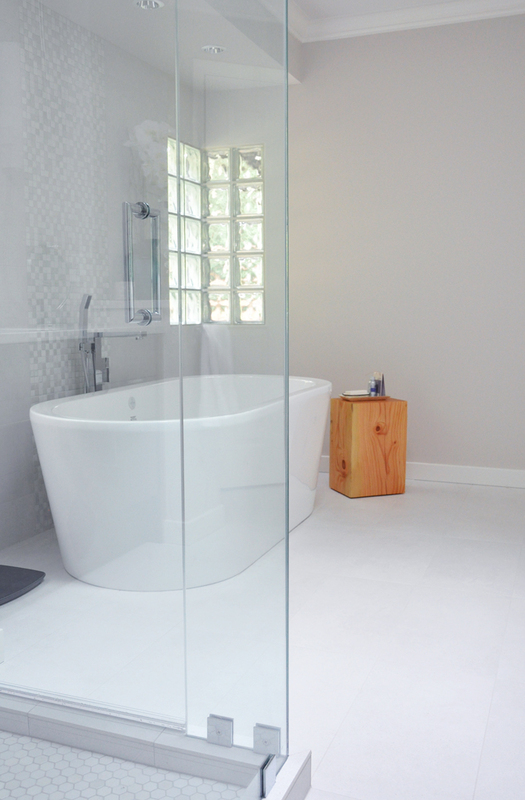 The large free standing bath tub is an Acritec Marseille freestanding tub with air jets, white colour and an Aquabrass Madison freestanding chrome tub filler. To learn more about this bathroom renovation and Coordinated Kitchen and Bath’s full service custom kitchen and bath renovation services, visit our showroom at 123 East 1st Street or call us 604.985.9128.